Rural Alaska students, including some from the Yukon-Kuskokwim Delta, gather on the UAA campus to prepare for the ANSEP Middle School STEM Academy on Friday, November 30, 2018. 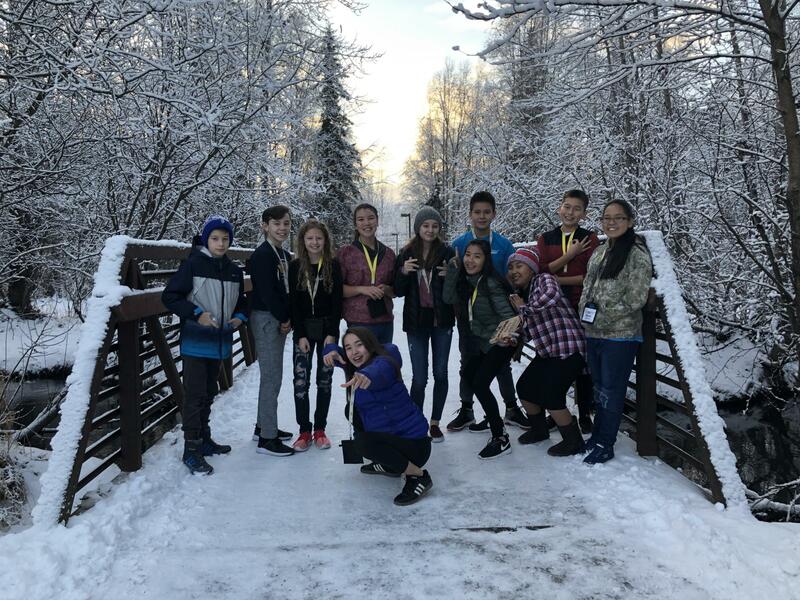 Middle school students from multiple villages including Kongiginak, Quinhagak, Kwigillingok, Napakiak, and Kasigluk will be traveling to Anchorage this weekend to participate in the ANSEP Middle School Academy. The students will stay at the University of Alaska dormitories for five days to participate in career exploration activities to increase interest in science, technology, engineering and mathematics careers. My name is Daniel Slim, and I am from Kasigluk. Last time at ANSEP I made new friends, made computers, and built a bridge. My name is Trish Merritt, and I am from Quinhagak. Last time at ANSEP I made friends and a tower. We put it on a shaky table and it broke, but we learned a lot. Bethel Regional High School Wrestlers will be traveling to Grace Christian School for the Grace Grizzly Grappler. This is their last competition before the 2018 regional wrestling championship at Bethel Regional High School next weekend. Good luck Warriors! The Akiuk Grizzlies are headed into Anchorage this weekend to compete in the state competition for mix-six volleyball. We wish them the best! This was Rebecca, Daniel, and Trisha and that’s what it is at LKSD. “What It Is At LKSD” is a weekly roundup of events happening throughout the Lower Kuskokwim School District. The series is produced in partnership with LKSD and KYUK. This week's episode was produced by sophomore Rebecca Samuelson of Bethel Regional High School, eighth grader Daniel Slim of Kasigluk, and seventh grader Trisha Merritt of Quinhagak. Slim and Merritt will be attending the ANSEP Middle School Academy.